After seventy bewildering minutes of Massimo Cellino’s press conference on Thursday, it might seem perverse to wish for more. But the greater and more useful revelations are often those that take place off camera, away from the press. After all, what took place on camera in front of the press was of little use to anybody. First of all there was the mid-session break: exit Cellino, pursued by Terry George; off for a cigarette, not before he’d paused next to the YEP’s Phil Hay and made a strange writing-on-a-notepad gesture while Adam Pearson tried to carry on answering questions behind him. If you’ve ever watched a snooker player take a mid-frame toilet break, you’ll know what this was like; the pause as everybody processes the fact that one of the protagonists has walked off, the unease as people adapt to the changed dynamic, the unsettling feeling of not being sure if he’s actually going to come back. It would have been good to know where Cellino went and what Cellino did during those minutes away before he came back, declaring “Beautiful cigarette!” and clutching a paperback book. How did he do… what? One of the most mystifying aspects of the many mystifying aspects of a very mystifying press conference is that we’ve all been left mystified about why it even happened. It seemed to come, as Cellino said on several occasions about several things, “from the moon.” Did it come in peace? Was its mission accomplished? Why exactly did Massimo Cellino hold a press conference on Thursday? And I know, technically, this was not Massimo Cellino’s press conference, just as the press conference to announce Dave Hockaday was not Massimo Cellino’s press conference. Taking the Junior Lewis memorial seat to Cellino’s left this time was Adam Pearson, and the pre-presser optimism could only have been higher if Lewis Cook had taken the Hock-seat to Cellino’s right. The return of Pearson and the clinching of Cook were the nearest things Massimo has played to a blinder for months, and this column was very nearly going to be written in a tone of dazed delirium about the sudden rush of good news. Massimo Cellino, infuriatingly, is only ever one or two good moves away from good form; partly because he does do good, right things occasionally, and partly because, despite everything, he still enjoys a lot of goodwill from fans who want to see him, and by extension the club, succeed. Leeds fans are, by and large, an easy-going bunch – we let Bates and Harvey have their way with the club for almost a decade – and weeks like these are worth more than I think even Cellino realises. There’s been bad and good this week: the list of released players will split opinions, but for me Austin is a loss given what our track record says he’ll be replaced with, I’m sentimental enough to wish White had been invited to stick around, and we only have one goalkeeper now; but Lewis Cook looked happy with his extended contract, and that’s important. Cellino still hasn’t spoken to Neil Redfearn, and that’s ridiculous, especially given the echoes of last year and the hunt for Brian McDermott; but he has spoken to Adam Pearson, and somehow convinced a guy with a knowledge of the club and a reputation for sound thinking to come aboard and help, where help is urgently required. That, especially for Massimo, represents a good week, and there have definitely been reasons for optimism. Adam Pearson, in particular, was a welcome shock; like the figure emerging from the steam at the end of The Railway Children before a disbelieving Jenny Agutter: “Daddy, my daddy!” Like all the best ones – Lucas Radebe, Howard Wilkinson, Martin Hiden – Pearson represents a time before the madness, when Leeds United were a lark ascending and, like a Yeboah scoring streak, it just got better and better and better. Pearson is also remembered round here for noticing in time when things were about to get worse and worse and worse. Leeds United in the Champions League era was like an anti-drink drive advert, where nobody realised how drunk Party Pete was until his mates had abandoned him and he was alone at the wheel. Among the first to opt for a taxi home was Adam Pearson, which is why it’s a surprise to see him clambering into the speedboat next to Cellino now. Nervous laughter wasn’t supposed to be part of the Pearson script. Neither was the fact that Pearson didn’t appear to have even read the script. With Cellino out of the room, Pearson opted to answer questions quickly and curtly; a mistake, in retrospect, because that meant there were a lot of them, and he wasn’t prepared. “I’ve been here three days, and there don’t seem to be any communication problems between anyone,” he said; he also said that he hadn’t spoken to Neil Redfearn, he didn’t know if Cellino had spoken to Neil Redfearn, and he didn’t know if Cellino had plans to speak to Neil Redfearn; oh, and he didn’t know if Nicola Salerno still had a job. But apart from that, communication is fine. Relax, baby, relax. And as for Neil Redfearn? His future isn’t a decision that needs to be rushed into. With that, all hope was lost. Mr Cellino said near the start of the press conference – before the cigarette, and the shouting, and the foaming at the mouth – that he and Adam would work well together because they wouldn’t have to have meetings – they would talk for a couple of hours, decide who was cleaning the floor and who was mopping it, and then go and do it (the actual cleaning/mopping metaphor went on a lot longer than that, but you get the picture). The idea that Adam Pearson might actually have some input into the decision making process began to feel slightly silly; a shame, because giving Pearson input into the decision making process would have been the best decision Cellino could have possibly made. There followed a complaint that in Neil Redfearn’s first or second game, there were “£9.2m of wages in the stand”; and with this, the paperback hit the table and he folded his arms. “The £10m for McCormack went all on the garbage,” because the coach wouldn’t play the players he was given, bought with money that Cellino said was not going to be spent on players anyway; but the idea that the coach should be able to choose players that he would play got short shrift. Mistakes and responsibility – it’s like Cellino expects to fail, and the whole system is geared towards blame; blame Cellino is happy to take. But he is also happy to give blame out. He wants to decide who the club should sign, so that if the club signs the wrong player, he can hold his hands up and bear the burden of the responsibility: fair. But he also wants to have a coach he can fire at will, so that if they don’t, for example, make the best use of Brian Montenegro – and that’s the example Cellino gave – then Cellino has someone to blame, a way to say: this isn’t my fault. Unfair. It didn’t take long to get into it, though. Massimo Cellino’s problem with Neil Redfearn, according to the evidence of this press conference, is that Redders was working as a waitress in a cocktail bar when Massimo picked him out, shook him up, turned him around and turned him into someone new. Now, five months later on Redders has the world at his feet, and success has been so easy for him; but he’s forgotten it was Massimo who put Redders where he is now, and he can put him back down too. There was more, and the anger and resentment rose as the minutes ticked by. Cellino promised he would never fire a coach who is good for the club “because he has a personal problem with me”, a classic bit of it’s-not-me-it’s-him-ism; he told a convoluted tale about how nobody so much as noticed Charlie Taylor except Cellino, least of all Redfearn, and how he had to sell Stephen Warnock behind Redfearn’s back just to get him to notice Taylor; the idea seems to be that Cellino is responsible for all the good young players – the Redders generation – supported by Redfearn’s refusal to get the best out of Montenegro. “He has many agents,” Cellino said of Redfearn near the start, before he got warmed up, which was taken to mean supporters, which was taken to mean that Cellino is paranoid about how well Redfearn is liked. By the end, when Cellino was flapping his arms and pounding his chest, there could be little doubt that paranoia, and jealousy, is the problem. Pretty much the last question of the day came with the point that the situation with Neil Redfearn, that has angered so many fans, looks pretty easy to solve. Or too close with his agents. It was around this time, as the conference drew to a close, and Cellino started doing a sarcastic Leeds salute to accuse fans of pretending to love the club – “Less touching the crest! And start putting the money! … Tell them to start to buy season tickets! 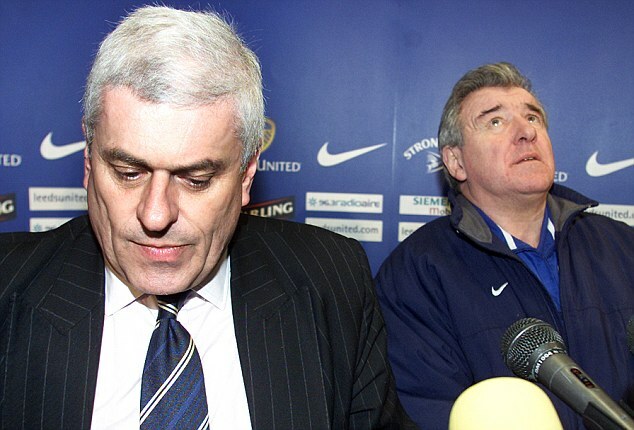 Then we talk about the club!” – that Adam Pearson’s hand went well and truly to his mouth and he began to resemble Terry Venables sat next to Peter Ridsdale back in 2003, that Cellino was basically talking exactly like Ken Bates – ‘the fans might not like what I’m doing, but they have to take their medicine, and the silent majority don’t want me to worry about 200 noisy fans’, that Cellino was also literally foaming at the mouth, pounding the table with a book, rising out of his chair, angry about something, about something at a press conference that had lasted seventy minutes with a cigarette break but no news, that he had called so that people could ask him questions, that he had begun by complaining about the type of questions he was asked and ended by saying it was disrespectful to ask him to justify his decisions publicly, while in between he contradicted his former statements about the club in more ways than we can even begin to touch on in an already too-long column – it was around then that we wished the cameras would stay running just a little bit longer, stay with Massimo as he left the room and returned to his newly redecorated office. Because that way we might have found out what the hell it was all about.